In skilled hands, it means masterful artistry for the dental patient. What he does at his own Downey dental practice is nothing short of amazing. Dr. Bhakta uses one of the few fully digital panoramic tomography x-ray systems in the U.S. This system produces clear images while reducing the patient’s radiation exposure by as much as 90%! Dr. Bhakta can see the patient’s roots of teeth, the position of un-erupted teeth, and a two-dimensional measurement of the bone and soft tissues surrounding their teeth. He can best make complete evaluations of each patient’s condition for the most successful treatment planning. Drill-less Dentistry… the best Dental Technology! And the secret is air! Air abrasion is a wonderful alternative to traditional dental filling techniques. Using a stream of air and aluminum oxide particles, the air abrasion system gently removes minor tooth decay without the need for injections or drilling! Our patients love it. The ability to see in such microscopic detail means that Dr. Bhakta can catch and remove any calculus, bacteria or pinpoint potential dental issues. The Intraoral camera is a tiny device that allows Dr. Bhakta to view, along with you, an enlarged image of your mouth. Dr. Bhakta uses this tool to save lots of time and money for patients. Seeing is believing. In the hands of a skilled artist, laser dentistry becomes a powerful tool. The patient gets the ultimate in comfort while also receiving thorough diagnosis and care. Laser dentistry is not only extremely comfortable for people, it’s excellent for a person’s soft dental tissues. Dr. Bhakta doesn’t send you home with a temporary crown. You go home with the real thing! Made of natural-looking and durable porcelain, crowns and onlays are molded to fit over an entire tooth, improving the look of chips, cracks, stains, and other imperfections. By protecting the tooth from further damage, porcelain crowns can eliminate the pain associated with decay or injury and make speaking and chewing much more comfortable. 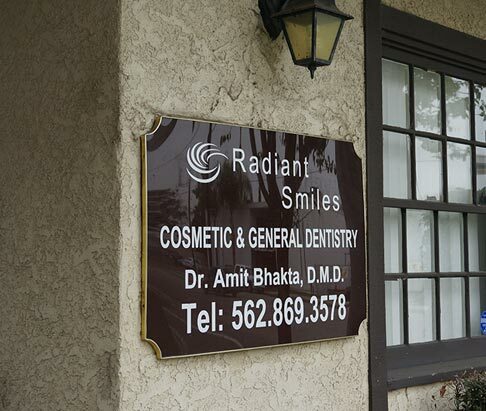 Dr. Bhakta crafts your porcelain crown to suit your face, your personality and your lifestyle. Sturdy, gorgeous and all yours for a long time. When you book your appointment, let’s talk about how our technology and amenities will benefit you.